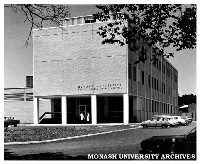 In November 1963, the Department’s first Head of Department, Professor Richard Nairn, his secretary and technician relocated from temporary accommodation in the Menzies building, Clayton campus, to the 3-storey Monash Medical School at the Alfred Hospital campus. There was a rapid expansion of staff, ready for first batch of 32 4th year medical students in February 1964. Initial plans for a Monash Clayton campus hospital to be established by 1969 failed to get beyond the planning stage. 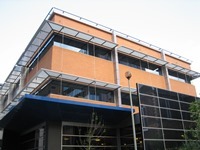 As further clinical departments were established at the Alfred campus, an extra two floors were added to the building by 1967. Over the years, as some departments relocated and there was an expansion of the Department’s research activities requiring specialist laboratories for equipment such as the flow cytometer and electron microscope, the Department expanded over 3 floors of the building. By the early 1990’s it was clear that the Monash Medical School facilities were no longer suitable or adequate and the Department needed a new home. The construction of the Alfred Medical Research and Education Precinct (AMREP) presented the opportunity for the Department to relocate into modern laboratories with shared research facilities in 2002.